Palms affected include Cocos plumosa, Phoenix canariensis, and Washingtonia filifera, W. robusta resistant. In the United States it’s found in Coastal areas of central and southern California. Favored by cool, foggy weather. Watch for dying of terminal buds; leafstalk bases rotten; tree eventually dying. Infection is by conidiospores moving throughout crown whorls until all leafstalks are infected. Once infection is established it continues all year. 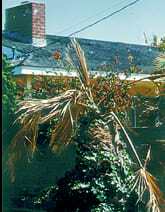 Inoculum may spread rapidly to nearby palms.